Her expression was calmly attentive, as if she had been waiting, for minutes, perhaps years, knowing it was only a matter of time before Mabel came to this place in the woods. 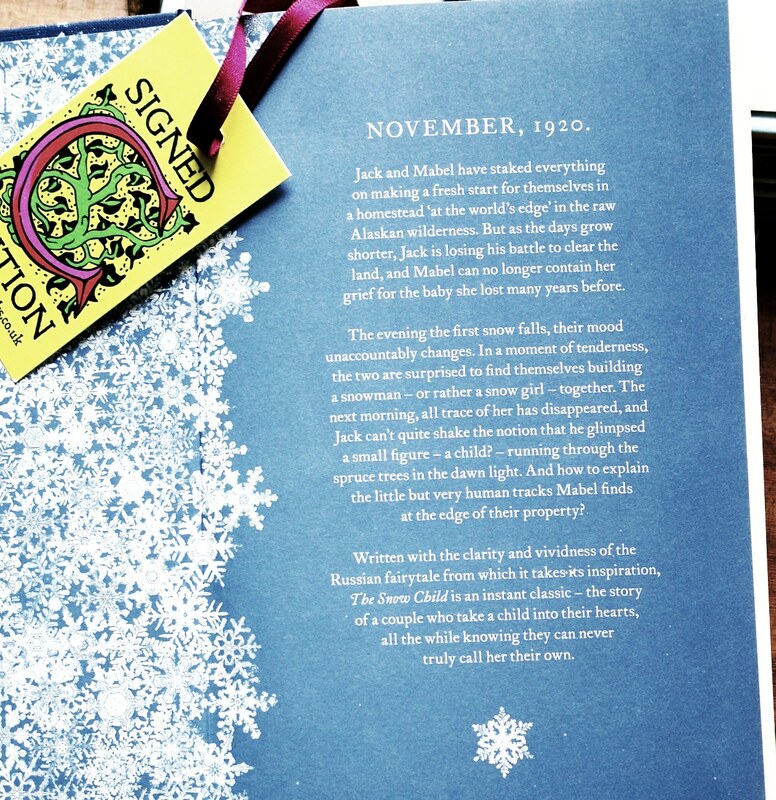 The UK edition of The Snow Child by Eowyn Ivey, 2012, is published by Headline Publishing Group, London. The Snow Child is based on a Russian fairy tale (which features in the story and is included as an appendix) whereby a couple in their 50s in 1920s Alaska make a young girl out of snow. The next morning the snow girl is gone, as are the mittens and scarf she was wearing. It is one of many stories throughout human history based on an artificial girl/woman apparently coming to life. It was read out on BBC Radio 4 and I was so impressed I bought a signed copy of the book. The author, Eowyn Ivey, lives in Alaska, so she knows what she is talking about. Guys like me have only the vaguest idea of the physical and emotional duress women go through in bearing children and bringing them up, or the psychological effects of failing at some stage in that endeavour. This story educates us somewhat in that respect. She had survived that, hadn’t she? It was as if she had reached into her own pocket and discovered a small pebble, as hard as a diamond, that she had forgotten belonged to her. It is well written. Its only ‘non standard’ effect is that, when the girl who is the subject of the story appears, all dialog between the girl (who the story follows from about ten years old to about 19) and the couple is without speech quotes. It is a bit strange, but there is a reason for it. The day of the wedding came, and Esther was right – the cabin wasn’t finished, but it was all the more lovely, like a cathedral sculpted of trees and sky. Mabel walked there in the morning and was grateful to be alone. The women do not monopolise the suffering, however. Jack sustains an injury bad enough in modern times, but magnified by the remoteness of where they live. (For what it is worth, I had a similar injury in 1981 – the result of a hang glider crash – and the description in the story is accurate.) Fortunately, Jack and Mabel have a neighbour only a few miles away. Esther and her large family are established farmers; able and willing to provide the help that saves the situation. Indeed, their youngest boy, an independent sort, rescues the story from being one of bad news from beginning to end. A girl living wild in the woods sees herself in a mirror for the first time. Apparently, she has never before seen her own reflection. I find that hard to believe, even where ponds and rivers are frozen most of the year, the pools that result from the spring thaw surely provide plenty of opportunity for a girl living rough to see her own reflection, however muddily. The story seems to me entirely realistic with one possible – even probable – exception. The girl in the woods is capable of conjuring up a snowstorm out of thin air. To be fair, snowstorms do come out of thin air and it is possible, in theory, for people to trigger meteorological phenomena. (I read an account by a well respected Australian hang glider pilot that he ‘makes thermals’ by carrying out steep turns near a wind-facing ridge.) However, the snow child does so merely by running and waving her arms. Even if a girl is so in tune with nature that she can detect when the atmosphere is about to precipitate its load of suspended water vapour, to trigger a localised snowfall in that way seems a bit of a stretch, in my opinion. Nevertheless, The Snow Child is a great read. The neckline scooped modestly along the collarbone. It was nothing like the flapper style so popular in recent years; nor was it in the style of the high-necked, formal gowns worn in Mabel’s youth. This was something different, something that reminded Mabel of European brides in country chapels, of alpine beauties, of Russian maidens.